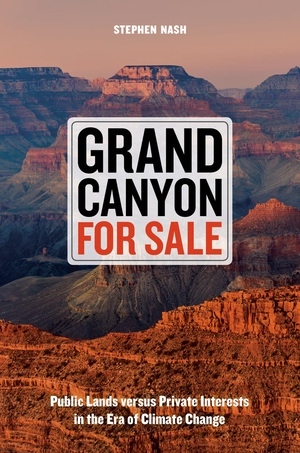 Grand Canyon For Sale is a carefully researched investigation of the precarious future of America’s public lands: our national parks, forests, wildlife refuges, monuments, and wildernesses. Taking the Grand Canyon as his key example, and using on-the-ground reporting as well as scientific research, Stephen Nash shows how accelerating climate change will dislocate wildlife populations and vegetation across hundreds of thousands of square miles of the national landscape. In addition, a growing political movement, well financed and occasionally violent, is fighting to break up these federal lands and return them to state, local, and private control. That scheme would foreclose the future for many wild species, which are part of our irreplaceable natural heritage, and also would devastate our national parks, forests, and other public lands. To safeguard wildlife and their habitats, it is essential to consolidate protected areas and prioritize natural systems over mining, grazing, drilling, and logging. Grand Canyon For Sale provides an excellent overview of the physical and biological challenges facing public lands. The book also exposes and shows how to combat the political activity that threatens these places in the U.S. today. Stephen Nash is the author of two award-winning books on science and the environment, and his reporting has appeared in the New York Times, the Washington Post, BioScience, Archaeology, and the New Republic. He is Visiting Senior Research Scholar at the University of Richmond.